American automaker Chrysler announced recently that it would close nearly 800 dealerships across the country, and GM just announced it will cut off 1,100 dealers. Long seen by cities as an easy way to boost tax revenues, the departure of these dealerships is expected to deal a blow to many city budgets. Their closure will also leave cities with huge empty plots of land. 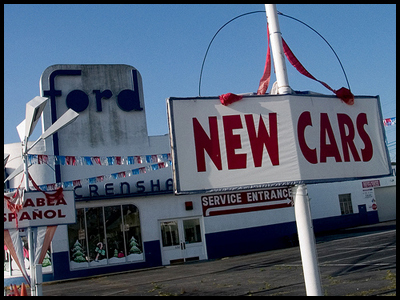 We want to know what you, the Planetizen community, thinks cities should do with these newly empty car dealerships. Should they be converted into parks? Replaced with housing? Preserved as historic sites? Let us know your ideas, and vote on the ideas submitted by the community. Participate in the brainstorm by submitting or voting at http://feedback.planetizen.com/. Editor's Note: This forum is now closed.